If you’re just getting started canning, or you’re thinking about giving it a try to see if you like it… buying all that food canning equipment is expensive! Buying used canning equipment is a great option, and can save you tons of money… but it can also be dangerous (and sometimes MORE expensive) than buying brand new equipment. There are several things to consider when looking at used canning equipment. First of all, make sure to do some research so you know how much it costs to buy each piece of equipment brand new before you start shopping for used canning equipment. 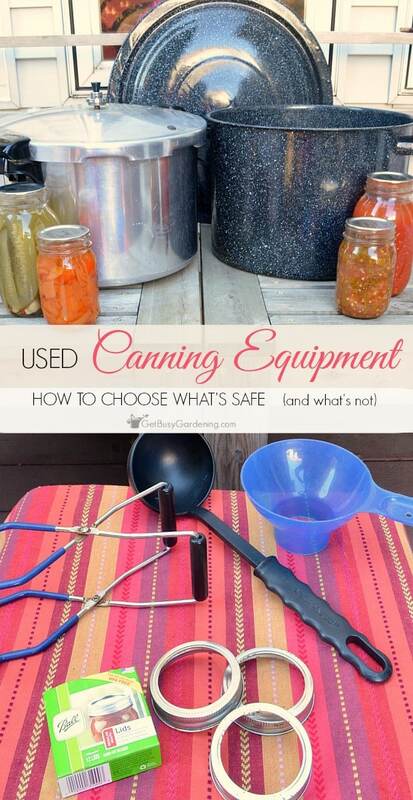 Second thing you’ll need to keep in mind is the safety of used canning equipment (especially the really old stuff). Is Used Canning Equipment Safe? That depends on a few things… how old is the equipment, and what condition is it in. Food canning safety standards have changed over the years. 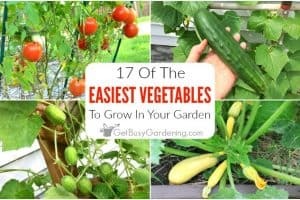 The equipment and supplies are also different than they were when our grandmas were canning the food from their gardens. 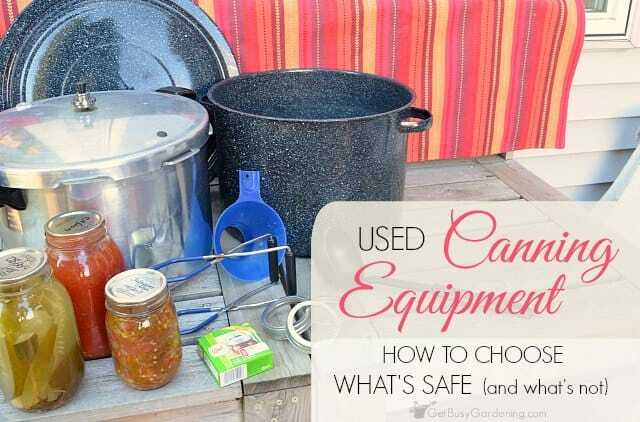 Old canning equipment and supplies might not be safe to use anymore. You also want to make sure that the used stuff you get is in good condition, so you can feel good that you got a great deal – right? Here are some things to think about when you’re looking at used canning equipment. Finding discount canning jars, or a killer deal on used ones is a huge win! 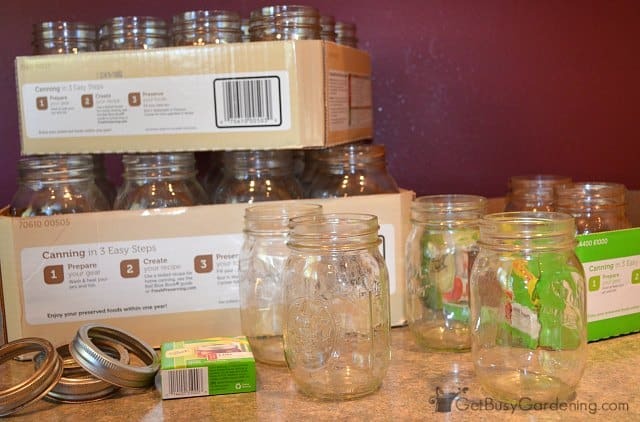 But glass canning jars aren’t very expensive to buy brand new, so make sure to price them out before buying used ones. 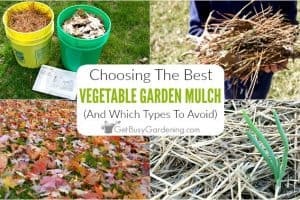 You’ll also want to inspect them carefully for nicks, chips and cracks before buying them. 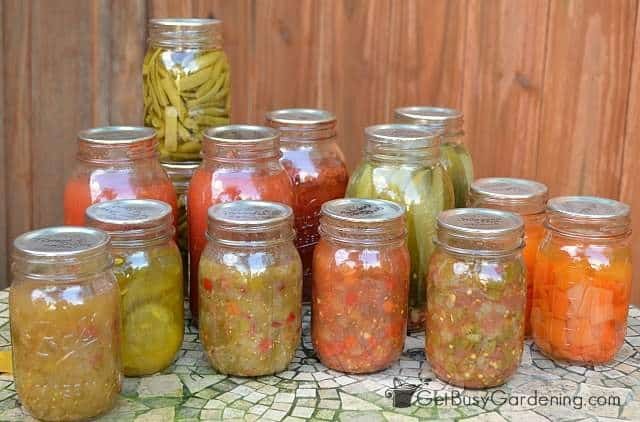 You never want to use any damaged or disfigured jars for canning food because they are not safe (or they could break during processing, wasting all your time and food). Also, make sure you know what you’re getting when you’re shopping for used canning jars. Several types of older style glass canning jars are no longer recommended for canning, and can be dangerous to use. The glass on super old canning jars can be brittle, and may not survive in modern pressure canners. First of all, canning jar lids are never reusable for canning food. 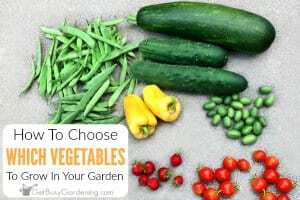 Once they have been used for canning food, then you need to toss them into the recycling bin (or find some fun crafts to use them for!). I would not recommend buying old canning jar lids either. Canning lids have changed over the years, plus the sealant on old lids may have deteriorated over time. Using old canning lids isn’t something you want to mess with, because they might not form a good seal on the jar. 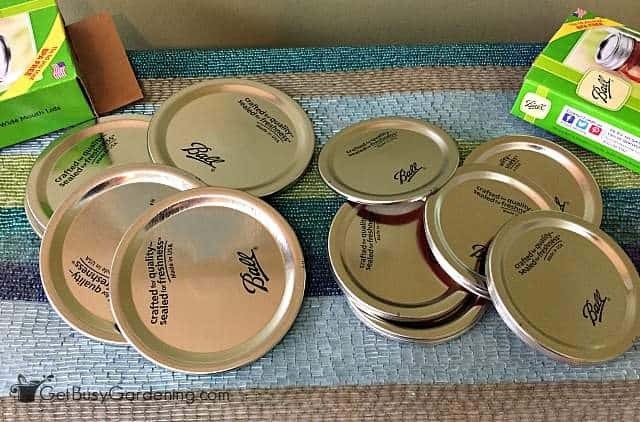 Canning jar lids are very inexpensive to buy, and totally worth the cost to ensure your food doesn’t spoil (or worse, make you sick!). Just be sure to get the right sized lids for the jars you buy – either wide mouth lids or regular mouth canning lids. Canning jar rings on the other hand can be used over and over again, as long as they’re in good condition. Metal canning jar rings tend to rust over time, so make sure you inspect used ones before you buy them. Small rusty spots on the outside edge won’t be an issue. But canning jar rings with rust on the threads could interfere with the seal. Any rings with rust on the threads should be tossed into the recycling bin. Brand new canning jar rings usually come with the lids too (bonus!). Just make sure you buy the correct size for the canning jars you bought. There are two sizes, wide mouth lids and bands, and regular mouth ones. When it comes to buying food canning equipment, a pressure canner will be your biggest single investment. It’s super smart to find a used one if you can… but using an old pressure canner could also be very dangerous. 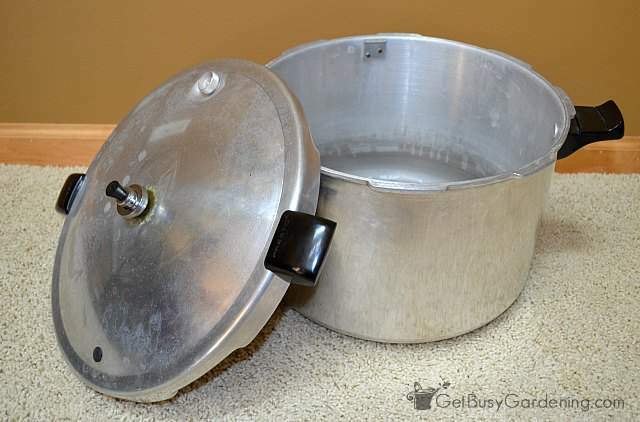 You should only purchase a used pressure canner if it is in excellent condition. Pressure canners build up a lot of… well, pressure when they are used, and in extreme cases, could literally explode if the canner is defective or damaged. Yikes! Who wants to mess with that?! So, before you decide to purchase a used pressure canner, inspect it very carefully. If you find any imperfections, dents, warping or other damage, then don’t buy it. Also, make sure the lid fits perfectly on the pressure canner, and that it easily locks into place. The pressure canner lid should go on easily. If you have to force it to get it on, or to lock it into place, then it’s probably damaged or warped so don’t buy it. 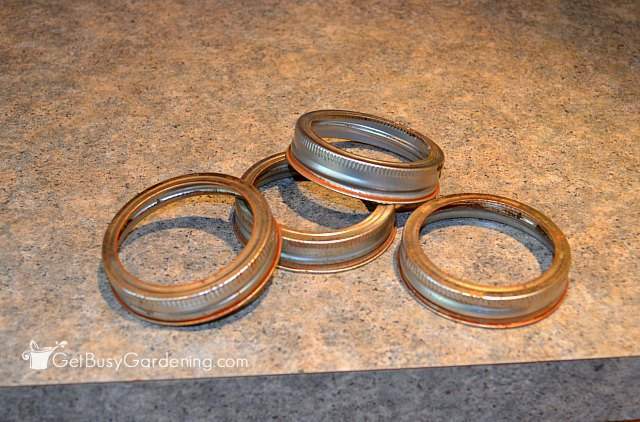 If you do buy a used pressure canner, I recommend buying a new sealing ring for the lid (make sure to get the recommend one for your brand of pressure canner). 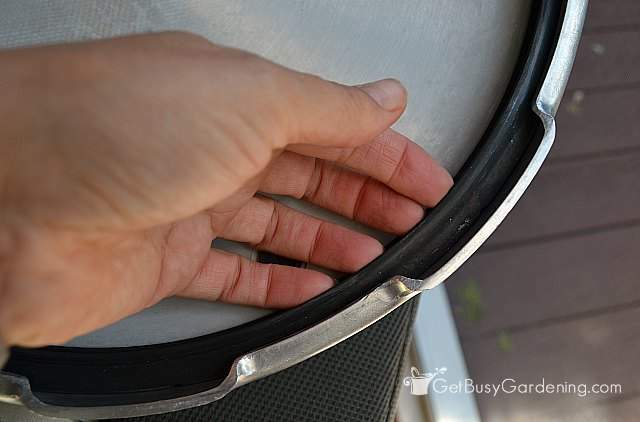 At minimum you should inspect it before using the canner to ensure that it’s in perfect condition, and there aren’t any cracks, rips or other damage to the sealing ring. 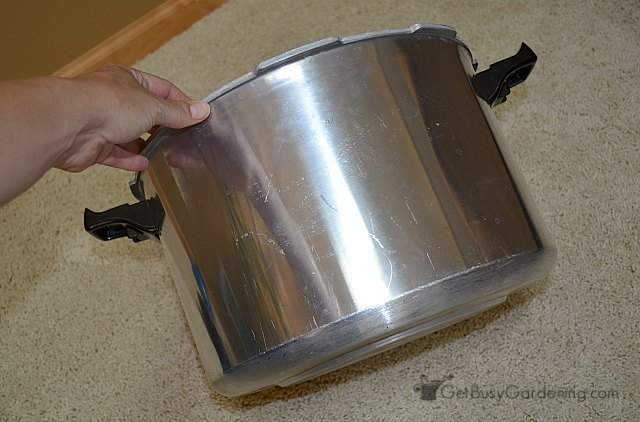 You don’t have to be as careful buying a used water bath canner as you do with a pressure canner. If there are minor dents or dings on the pot, it’s still safe to use. Heck, the lid doesn’t even have to fit on the pot perfectly because it doesn’t need to seal. 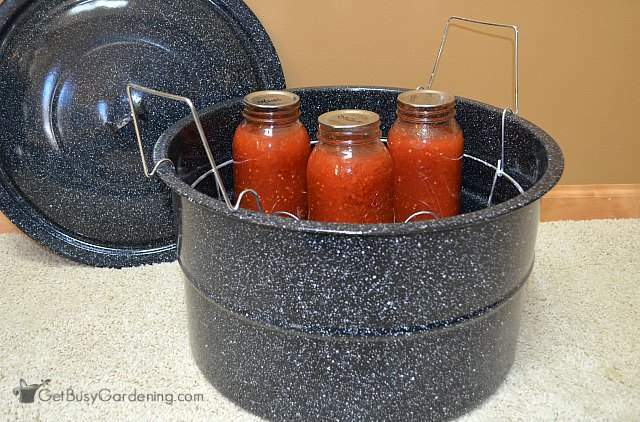 Look for a water bath canner that comes with a rack or has a rack on the bottom. You don’t need the rack, but it’s a huge bonus if you’re choosing between a few used ones. Just like any kitchen utensil, canning utensils can be re-used indefinitely without any danger. 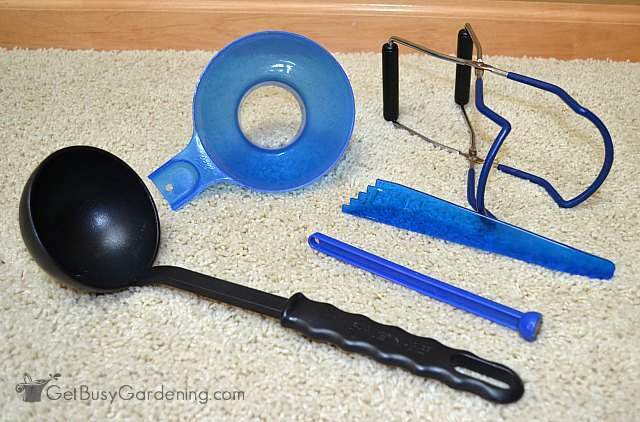 If you’re shopping for used canning utensils, I recommend getting a canning funnel, canning jar lifter, a kitchen food scale, lid and band wand, and a large ladle. Canning recipe books are probably a dime a dozen at thrift stores and yard sales… but I would highly recommend spending the extra money and buying a new canning recipe book. I’m sure there are probably a ton of great recipes in old canning books that would still work just fine today, but canning and food safety standards have changed over the years. Following up-to-date canning instructions from a reliable source is super important for food safety. 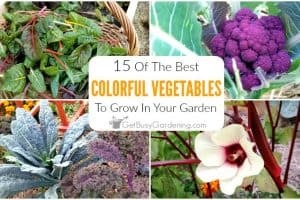 You worked hard to grow and harvest all that amazing food from your garden, so make sure you preserve it safely. 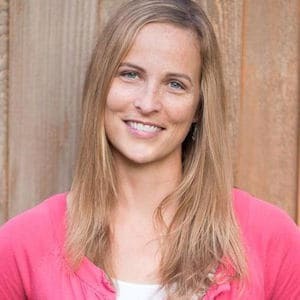 I recommend buying the latest version of the Ball Canning Blue Guide To Preserving – which not only has the safest food canning recipes, but also has the most updated instructions and tips for canning all kinds of food. 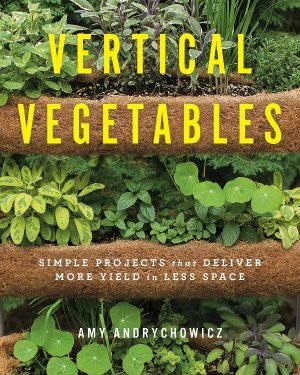 There are tons of great food canning recipes in this book! Home canning instructions, supplies and equipment have changed over the years. Buying used canning equipment is a fantastic way to save a ton of money, but just make sure you are smart about it! Plus, a lot of the equipment you need for canning is pretty inexpensive to buy brand new, so be sure to shop around before buying any used equipment to ensure you’re getting a great deal. What tips would you give someone who is shopping for used canning equipment?